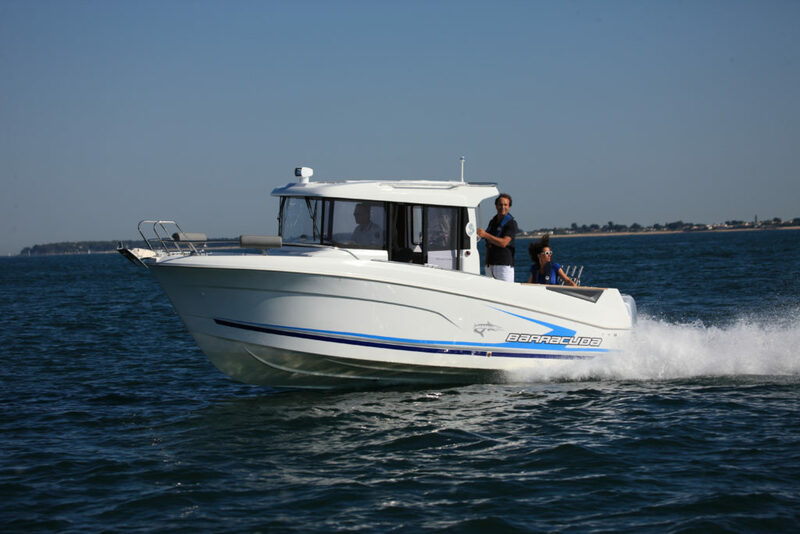 It is the smallest model of the Barracuda series but it is very versatile, not expensive and good for facing the sea even during bad conditions. As the last model of the Barracuda series, the seven use all the experiences accumulated in the other model. It also proposes the same concept but with a smaller size and a reachable price. 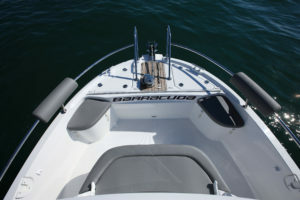 With this new generation of Barracuda, Beneteau seems to have taken into account the journalist and customer remarks to make the new one a real fishing machine, and this unit that was featured in the now traditional Barracuda Tour, a French fishing tournament. Regarding the esthetics, the Barracuda uses the same elements as the other models of the series with a strong Scandinavian inspiration. 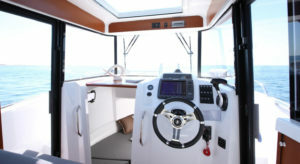 This is manifested through the important cockpit depth, an even deeper front part or the wheelhouse with a characteristic design that is reminiscent of Targa or Sargo. 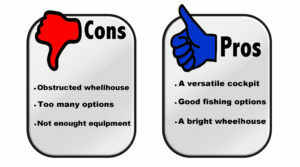 The boat is also available in two versions, one with the rear door, and one without. Once on board, we appreciate the ease of circulation, thanks to the wide passages. Good point again for the two cockpits (almost), one on the prow and one on the stern. On the front, in addition to a beautiful mooring tub, there is a bench and enough room to move, making it an ideal place to fish. The rear cockpit has many tricks. Apart from the two doors to go to the platforms, the space hides a sliding bench with a box inside. There is also a livewell in one of the rear passages and a cutting board with two small trays on the central part. This central part raises when the engine is in the low position, thus enlarging the cockpit. Three floor chests, including one with a removable fish tank, complete the inventory, making the Barracuda boat a good fishing boat. But it’s not only a boat for fishing. For family outings, it will always be possible to enjoy two lateral benches and a table (option) to transform the cockpit into a pleasant picnic corner or even into a small sunbath. Easily accessible thanks to the side door and the rear door (on the proper version), the interior is rather sober with a dominant white and a few touches of wood. Not voluminous, this wheelhouse benefits from a large glass surface that brings a lot of luminosity and gives a real feeling of space. The layout is fairly simple but rational and well thought. 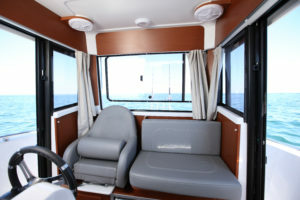 There are two seats facing the road, an additional seat on starboard hiding a sink and a location for a refrigerator. In the Scandinavian way, a round table stuck to the ceiling goes down to offer a little more conviviality. Good point again for the floor chests. 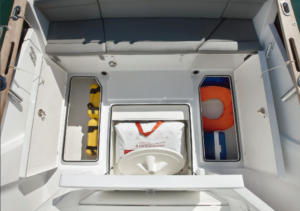 Last surprise, a door opens to a small forward cabin with enough space to accommodate a double bed, a toilet or simply offer a large storage space with, a small porthole. The barracuda can, however, be largely customized with a long list (too long) of options that give it a more fishing or family character. 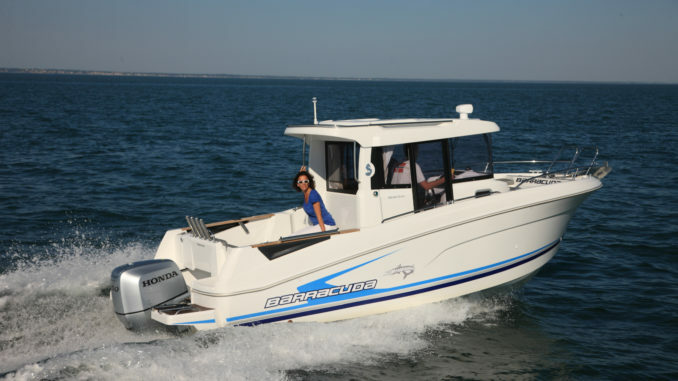 Versatile, the Barracuda 7 also offers real marine capacities. 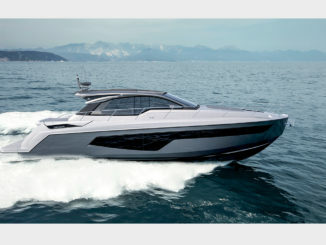 It gets an unprecedented new generation hull that adds real comfort. 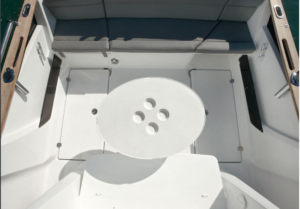 To obtain this result, the hull has an efficient step on the bottom, which brings more flexibility and more comfort. The Beneteau also has good support in the rear that provide a very good stability, an important detail for fishing and for a family cruise. To propel the Barracuda, the French builder allows up to 200 hp, enough power considering the target of this boat. Indeed, if we are on a planning hull, the speed is not the goal. 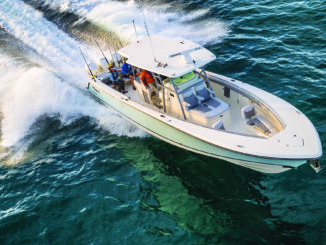 With this power, the fishing boat reaches 37 MPH with a cruising speed of around 25 MPH. You cannot even imagine 150 hp engine without losing sailing pleasure. 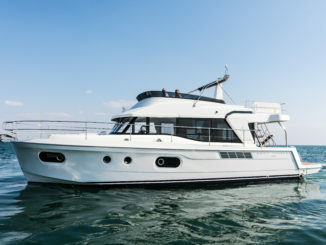 Easy to afford, easy to drive and to be used to go fishing or with your family, the Barracuda 7 offers a first step in this series and allows for sailing even when the weather is not perfect.